I made these printable syllable cards for chapter 8 of our book study of Literacy Beginnings. 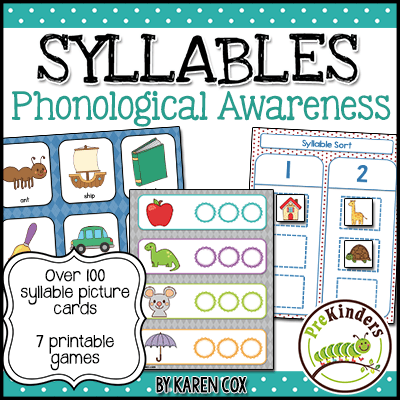 Chapter 8 is on Phonemic Awareness and Phonics, and this activity is mentioned on page 92 and again on 93. I made these cards pocket chart size. To introduce the activity, you show children a card (e.g. cat), say the word, and clap one time, then invite children to repeat it. Do the same with a two-syllable word (e.g. monkey) and a three-syllable word (e.g. umbrella). Continue with the rest of the cards. 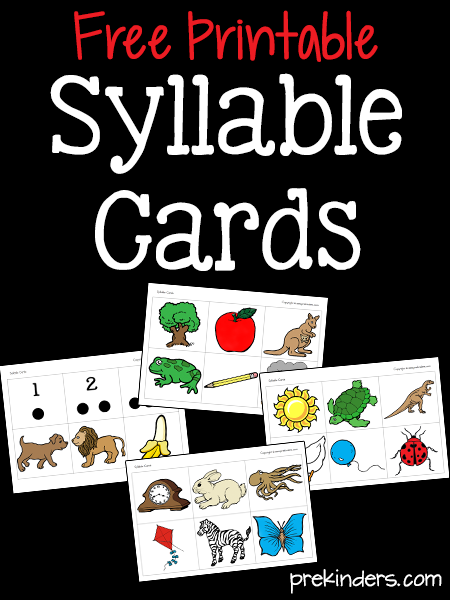 You can also have children sort the cards into the pocket chart by the number of syllables in the word. Rather than clap, you can also use rhythm instruments, such as drums, rhythm sticks, cymbals, etc. I think these cards will also fit into the Carson Dellosa pocket dice for a syllable game. Children would roll the dice, then clap the number of syllables as they say the word. This is a free printable, just click to download. These are great. Thanks again Karen! Thank you for all that you do for both teachers and kids! These cards, as well as your many other activities, are fantastic! Love these! I need to get this book. Just found your blog, awesome by the way, and I love this online community of bloggers. 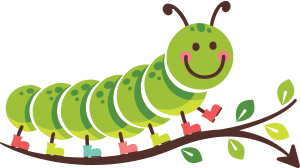 I have a website I put a lot of work into… http://www.2care2teach4kids.com, but I love this learning community you and the other bloggers have established. I can see how beneficial it is to be a part of this type of continuing learning community rather than always working on my website ALONE. I am so glad I found you! Thank you, Kelley & Kelly! Thanks Karen for the printable! Love it! What a great tool for learning syllables! Thank you for all the work you put in to these activities. I use several of your ideas last year and my preschoolers loved them. Thank you so much Karen! I absolutely LOVE your ideas … all of them. I really like the idea of rolling the die and clapping the syllables. I wish I had thought of that one. I will try that idea soon with my daughter (Alyssa). Oh how I wish I had the opportunity to read Literacy Beginnings with you all. I was unable to purchase the book but have enjoyed reading the blogs. I just wanted to say thank you for all the materials you post on your site. I use them frequently and mention them to my teacher friends often. I teach Kindergarten and these activities have been great! Thank you! I use the plastic picture cubes with pics and names of the students to help them learn each other’s names and to recognize their own names. I am excited to find other ways to use this idea….the kids really love playing games and I love that I am teaching them in a fun AND appropriate way. Thanks for all the great ideas and resources you share with us! Thanks for sharing these awesome printables Karen! I’ve got to catch up too! Karen, thanks for the printables. I am so glad that I decided to join this book study. The information & ideas have been great. Thanks, Arlina! Glad you like the book study! I almost feel guilty for using your website without paying! A great resource for ideas and manipulatives. I love that you do not incorporate worksheets. Many thanks and you are a blessing to my planning. Thanks, Lourie! I’m glad yo like the site. Do not feel guilty at all! 🙂 I’m glad to see there are others who agree that worksheets are not for Pre-K.
Karen I really enjoy your page it has a lot of resources that are helping me specially now that I have to cover a whole theme in one week. You are so lovely in let in me use some of your ideas. Love and thank you so much!!!!! This is an ABSOLUTELY GRRREEEAAATTTTT website. Thank you for sharing. Thank You for sharing.This is a great Website. Thank you very much these are great for a folder activity in literacy area. I also want to use them in small group sessions. Thanks again. This is a great way to help children understand how syllables work. I love the interactive nature of the activities! I’ve scheduled this for sharing on Facebook!